Roan Fields-Moffitt walks through a wooded area adjacent to Murdoch Developmental Center in Butner, N.C. on Thursday, Jan. 3, 2019. Desiree Moffitt, left, and Jacob Fields, right, watch their son Roan, middle walk through a wooded area adjacent to Murdoch Developmental Center in Butner, N.C. on Thursday, Jan. 3, 2019. Jason deBruyn reports on the portion of Medicaid called the Innovations Waiver, that help families of children with developmental disabilities with funding for medical care. Roan Fields-Moffitt likes to explore wooded areas. On a damp and cloudy early afternoon in January, he rustled through leaves, climbed over fallen trees and threw sticks in a stream. His dad, Jacob Fields, and mom, Desiree Moffitt, walked with him and took turns pushing Roan's 16-month-old twin sisters in a stroller. Roan, 6, was born with Fragile X Syndrome, the number one genetic cause of intellectual impairment and the number one single-gene cause of autism. Roan is non-verbal, but makes squeaking and woo-woo noises that let you know he's having a good time. And that's usually the case when he's outdoors. "That's just how I've raised Roan," said Fields. "Desiree and I have both been outside a whole lot. And this is kind of his peace." 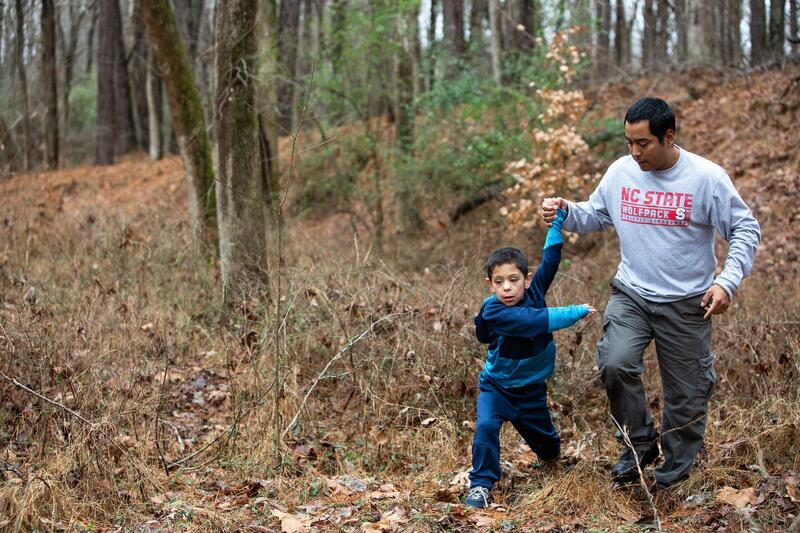 Jacob Fields, right, plays walks with his son Roan, left, in a wooded area adjacent to Murdoch Developmental Center in Butner, N.C. on Thursday, Jan. 3, 2019. Families of children with severe intellectual and developmental disabilities can qualify for help from the North Carolina Department of Health and Human Services through a portion of Medicaid called the Innovations Waiver. But limited funding to that program keeps thousand of families on a waitlist – including Roan. Roan's parents have had to work hard to raise him, and take things one day at a time. That means trying to meet his demands anyway they can. If that means hanging a swing in the middle of the living room, then that's what they do. "If it's taking him for a walk in the woods so that he can feel the texture of the leaves and hear the crunch as he walks, then that's what we do for an hour, two hours at a time," said Moffitt. "We have to keep him calm so that he's not attacking us or his baby sisters." On this January day, Roan's family met him at Murdoch Developmental Center in Butner, one of three state operated developmental centers. Roan was here because he can sometimes turn violent. He will pull his mother's hair. And he has turned on his younger sisters. "And then I'm left trying to peel my cognitively-impaired son out of my daughter's hair. And as I'm pulling, I'm trying to use my foot to move my daughter away out of range. But you know, I'm not always successful." 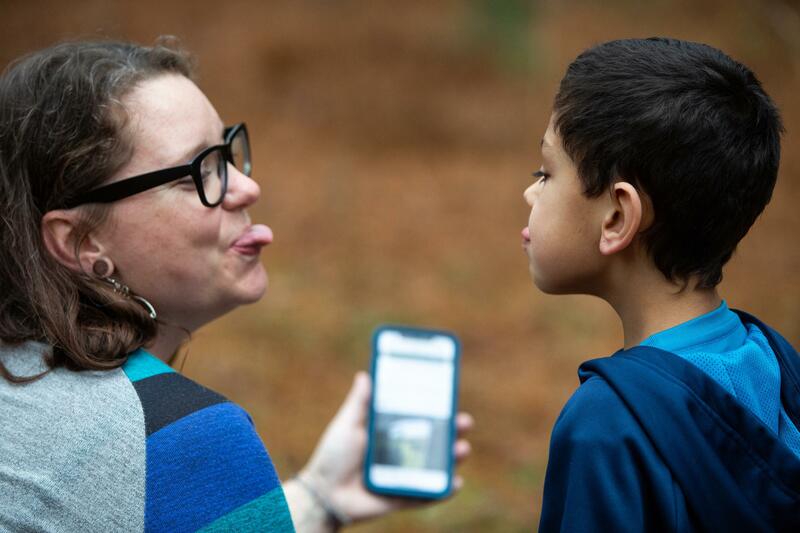 Roan Fields-Moffitt, right, and his mother, Desiree Moffitt, left, immitate a photo of a cow with its tongue out in a wooded area adjacent to Murdoch Developmental Center in Butner, N.C. on Thursday, Jan. 3, 2019. Putting a child in an institutional setting isn't what any parent wants. But Roan's parents feared he might become even more severely violent with his sisters. Fields and Moffitt want to care for Roan in their home, but can't do it on their own. Because they weren't getting the help they needed, they sought alternative solutions. One day, they made the excruciating decision to bring him to the emergency room of UNC Hospitals. "We cried together before we took him," said Moffitt. "I mean, when you are not given the help you need, and you have to decide to take your five-year-old child and put him in a situation that you don't even know what it looks like, but all you know is you have to get your kid out of your house because you have to keep your other kids safe, that's a disgusting decision that you have to make. And we made it. We did load him up. And we drove him there. And we asked for help." Roan stayed at UNC Hospitals for days, but that wasn't the right care for him. Ultimately, Fields and Moffitt decided to take him to Murdoch to see if that would help. The Innovations Waiver services are robust. Services for waiver slots are capped at $135,000 per year, though most people in the program don't use that much. The average expenditure per waiver slot is $65,000 per year, according to DHHS data. There are close to 12,500 active slots, but almost 12,300 more families on the waitlist, a figure that has grown every year since 2014. Roan's family lives in Carthage. Sandhills Centers is the group that contracts with DHHS to provide Medicaid services in that part of the state. Sandhills Clinical Director Sabrina Russell-Holloman acknowledged that limited funding leaves some families without the services they need. "I would say because Medicaid is very limited in what they will fund, for our I/DD population, that does pose some barriers for this population group," Russell-Holloman said. She added that there are limited options outside of Innovations. Some families have become savvy in how they apply for different streams of funding, "But outside of that there's not a lot of Medicaid covered services for our I/DD population," she said. North Carolina Department of Health and Human Services headquarters at Dorothea Dix in Raleigh. With an average cost of $65,000 for 12,500 slots, that's more than $800 million paid for the Innovations Waiver program every year. The federal government covers about two-thirds of that cost, but the remaining third falls to the North Carolina taxpayer. "What it really comes down to is the cost of the waiver slots is so expensive that it's difficult for any administration to ask for enough to eliminate that waitlist," said Dave Richard, the DHHS deputy secretary over Medicaid. "It is a robust benefit because the children and adults that are on the waiver have to have a significant disability to qualify. So there's a great deal of services that we can offer under the waiver, and obviously that costs a significant amount of money." And the Innovations slot stays with the beneficiaries for rest of their lives. "People with developmental disabilities are living longer lives. People don't turnover, which is really good, we don't want people to do that. But it is a lifelong service, so that's the other reason why you have to continue to expand it, but it's also difficult to keep the pace of the needs that people have." The Innovations services really are quite robust. But in some ways that makes it even more difficult for families on the waitlist, says Dr. Ave Maria Lachiewicz, a Duke Health Pediatric Neurologist, who sees patients with severe intellectual and developmental disabilities, including Roan. "Once the services get put into place, sometimes it really turns a family around in a really big way, and it's great to see. And so that's probably why we want these services so much for some of our other patients who can't get them," she said. Dr. Ave Maria Lachiewicz, a Duke Health Pediatric Neurologist, who sees patients with severe IDD, including Roan. But that's not always the case for rural North Carolinians, who have less access to specialized health care. "If it's a local family sometimes they can get a UNC graduate student, or some good-hearted Duke graduate who wants to spend a few years helping people in a more idealistic way before going to Wall Street or whatever. You know, we can get students who are quite amazing sometimes helping out," said Lachiewicz. There are discussions within DHHS to reduce Innovations benefits in order to broaden active slots. But that could harm those already in the program. Roan has moved from Butner to Springbrook in Travelers Rest, South Carolina. It's a psychiatric residential treatment facility, one of the most intense treatment facilities an individual can be placed in. Fields and Moffit don't want to keep him there long term. But, without moving from the Innovations waitlist to an active slot, their options to care for Roan at home are limited. So they wait. And thousands of other families in North Carolina, will wait with them. Thousands of Medicaid recipients across North Carolina are being denied government-assisted funding for personal-care services. In April 2015, the N.C. Department of Health and Human Services Division of Medical Assistance changed the requirements for personal-care eligibility. Governor Roy Cooper's administration is proposing an overhauled Medicaid program that would combine behavioral health and primary health care.